Our technicians have over 20 years of experience in handpiece repairs, so you can rest assured that your instruments will be repaired correctly every single time. We can service most dental handpieces long after the manufacturer replaces your model with a newer one or says they no longer have parts for it. Properly serviced equipment can continue to work well for many years. Fill out repair form and place it inside shipping box. Ship your broken handpieces to us for a Free Repair Estimate. We contact you with a repair estimate. 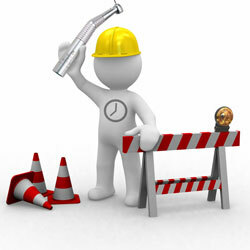 Upon your authorization and payment, your equipment is repaired and shipped back to you. If you choose not to have repairs made, you will be responsible for the return shipping cost of your equipment.